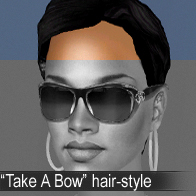 “Take a Bow” is one of my currently favorite songs, and I also must say that I just love Rihanna’s new style, so I have decided to make a hair, that’s inspired by her video for this song, but also by her appearances in various award shows in the last few months. I present you, the simple, but stylish hair style called “Take a Bow”. This is a hair with the side-bangs that goes behind the ears. Also, this is a short hair, but not regular, so it really looks glamorous. The hair pack includes four different colors for each color bin. Black, brown, red and blonde, all binned. The hair has some regular animations (not animated movements) so it doesn’t have glitches, and it doesn’t go through head. The hair is available for young adults, adults and elders. Elders hair is made grey, and it’s the same for all colors. You can include this hair (without the mesh) in your simpacks. And you can make recolors of the hair, with some proper credits. 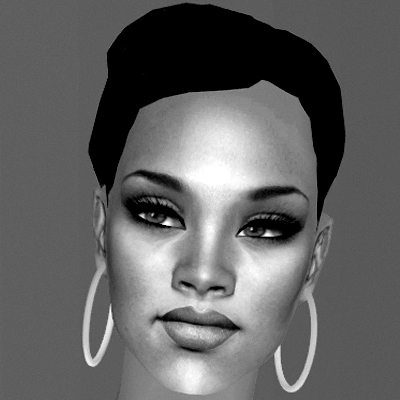 For my Rihanna sim, check the website. These recolours may or may not be endorsed by @Stefan. Nouk - Andre Hair - Short hair for the ladies!